The Bordeaux 2017 vintage represents a year of extreme contrasts that should provide wines that are ‘fascinating to taste’ come en primeur says winemaker Gavin Quinney. The map charting the frost damage Gavin Quinney compiled earlier this year. The clear result of the spring frosts which everyone was expecting is the vintage is drastically smaller than it was in 2016 (which incidentally was the biggest harvest in a decade for Bordeaux), with volumes forecast to be down 45% on last year and 40% lower than the 10 year average. In total 2017 should yield some 320 million litres compared to 577m litres in 2016 and it’s smaller even than 2013 which produced almost 400m litres. Overall, 2017 will produce 340m bottles less than 2016. On the other hand, as he goes on, the cruel reality is that while some areas have been wiped out, some have got by unscathed and those that did survive enjoyed an excellent growing season. Weather-wise, July was mixed but largely warm and dry (after some blistering heat in June), August hot and dry, there was some welcome rain in early September before warm, dry weather resumed in time for the harvest, which generally had finished by late September or early October. When picking began the effect of the frost made itself abundantly clear. On the Left Bank in the vineyards of the blue chip châteaux in Pauillac, Saint-Estèphe and St Julien, frost damage was minimal and Quinney notes the vintage looks, “very promising”, with very healthy Cabernet in particular. The leading estates in Margaux “got off lightly” but large areas in Moulis and Lsitrac were badly damaged, while it was “mixed” in Pessac-Léognan and Graves though harvest conditions were fine for those parcels that were unaffected. On the Right Bank, meanwhile, Quinney noted that while parts of Saint Emilion, including prestigious properties, “suffered considerable losses of up to 100%”, the plateau above the town where the likes of Troplong-Mondot and Canon are located “fared well” and enjoyed a “bumper crop”. It was a similar situation in Pomerol where vineyards on the plateau survived far better than those on the lower slopes. 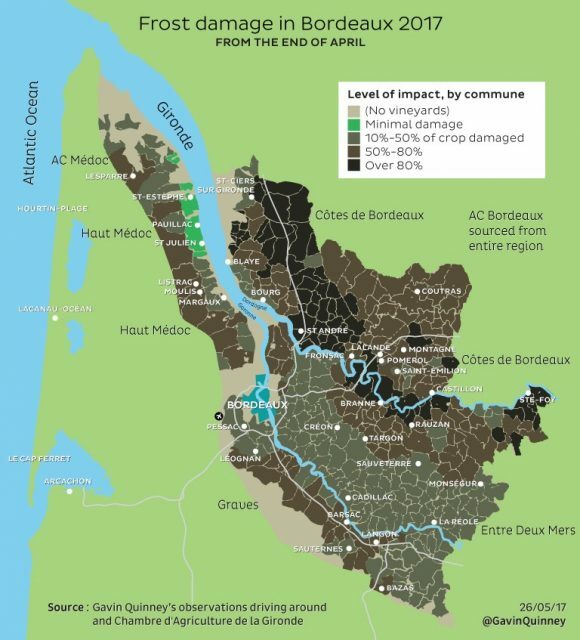 Elsewhere, in Lalande-de-Pomerol, Fronsac, the St Emilion Satellites and, “the engine room of Bordeaux of Bordeaux”, the AOC Bordeaux areas, the damage has been catastrophic in places and quality can be much more variable. Summing up, Quinney said 2017 was going to prove very heterogeneous but that it should prove a “fascinating experience” tasting the wines en primeur next spring (in the second not first week of April, do note). We shall see if time proves him right. His full report with photos and graphs can be read here.